Carmen and I visited Damien and Ragen in Highland Park this evening and we dined at nearby Metro Balderas. This is our third taco stop in Highland Park this year, and all three have been outstanding. Metro Balderas is a freestanding restaurant on Figueroa Street with a diverse menu and vintage-style booths where both the tables and benches are covered in textured orange laminate. There is a loud TV that was airing Sabado Gigante and a salsa bar with four types of salsa. A column in the very center of the space is wrapped tightly in nautical-esque rope; what would ordinarily be seen as an architectural problem was so easily transformed into an architectural opportunity. The specialty here is antojitos – food in the style of the DF. “Metro Balderas” is the name of a transit station in Mexico City; the business card is printed on the backside to resemble a metro ticket, but instead of reading “Sistema de Transporte Colectivo”, the card reads “Sistema de Comida Chilanga”. Chilango is a slangy term indicating origin in Mexico City with a complex history and meaning. 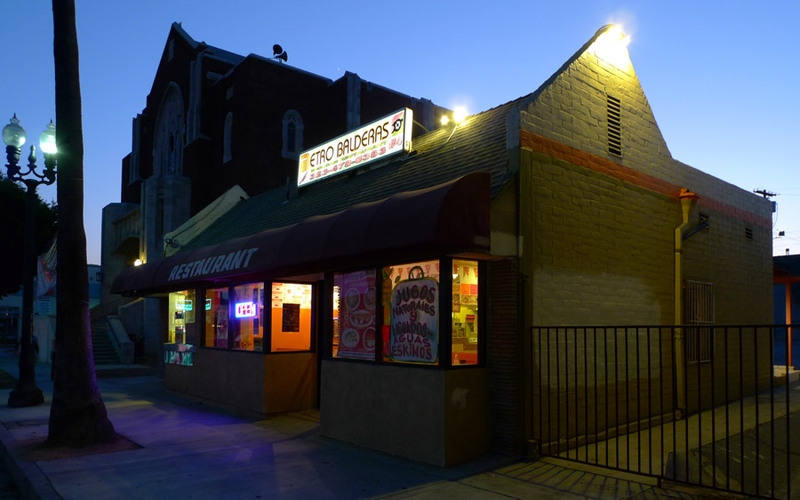 The DF-style items on the menu at Balderas are a bit different from your average Los Angeles taquería, and you may see things you don’t recognize like “pambazos” and “huaraches”. I can’t tell you too much about those, since I came for tacos. But I can tell you that this place offers DF-style carnitas on the weekends in eight different varieties. I didn’t get any of those, but I should have, because I should have read Jonathan Gold on the subject of Metro Balderas before I went there. What I did get is one each of the carne asada, al pastor, and suadero tacos. At $1.25 each, they were average to just above average size. The tortillas are small, doubled, unlaminated, homemade-style, corny, and with good hand-feel. Tacos were served with onions and cilantro, but no salsa – I tried a couple from the salsa bar, each of which was medium-spicy but the flavors varied greatly. The taco on top was the al pastor. The orange bits of pork had great flavor and were diced into varied chunks and little slivers, just as were the onions. It is a mystery how they effortlessly make such a mixture of cubish chunks and longitudinal slivers – some kind of dangerous, advanced surgical robot, perhaps. There were numerous identifiable chunks and slivers of pineapple scattered amongst the pork bits, nicely charred at the edges and caramelized. The pork was neither dry-rubby nor saucy – it seemed as if the flavors had been absorbed into the ingredients themselves rather than applied to the outside. This taco was a delight. The next taco was the suadero. 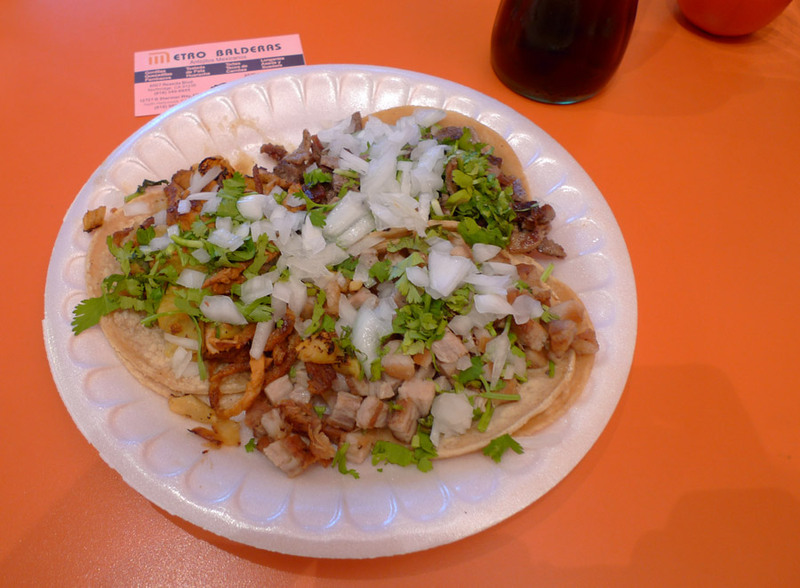 I thought I knew what suadero was after enjoying the suadero tacos at King Taco and El Taurino, but this was something altogether different – quite pale in color, diced into regular small cubes, and fried to extreme crispiness on one edge. It resembled carnitas far more than any beef with which I am familiar, and had a great texture. I could hardly convince myself it wasn’t pork, but it must not have been. I enjoyed this taco very much, but not as much as the al pastor. Lastly I ate the carne asada taco, which contained yet more surprise – the bits of steak that made up this taco were chopped from the thinnest cut of steak I’ve ever seen used for this purpose, about a millimeter in thickness. The grilling rendered these little bits of thin steak slightly resilient without being tough. The flavor was elegant, just beef, salt and black pepper – an absolutely righteous taco. All three of my tacos here reveal that behind the scenes, a considerate taquero is crafting tacos with much thoughtfulness and attention. patent pending on that ingredient-cutting surgical robot.